Map of Kimball, Tennessee dated June 1890. The town was laid out with wide streets and avenues with parks for enjoyment and various size lots for sale for construction of housing, industry and retail. The community was originally known as Wallview before being purchased by an organization ran by Mr. H. I. Kimball for which the town was renamed in honor of. Ground was broken for the town of Kimball, Tennessee on May 24, 1890. The photograph above shows a group of folks who attended the groundbreaking. 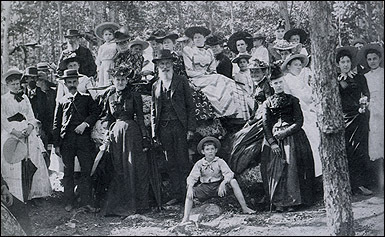 Hannibal Ingalls Kimball, for whom the town is named, is pictured center with long beard. The area around present day Kimball, Tennessee was a loosely knit community of farmers who lived off the land prior to the 1880’s. As the Sequachee Valley region’s resource of coal, iron ore and unlimited lumber became known around the world, communities from Bridgeport, Alabama to Pikeville, Tennessee caught the eyes of investors both domestic and abroad eager to build a city of a rural community and tap in on the coal and iron trade that had put city’s like Pittsburgh, Pennsylvania on the map. Kimball was to be no different. Before and by 1887, the towns of South Pittsburg, Victoria and Whitwell were established along the Jasper Branch Railroad and each had a connection with the mountains and the wealth of minerals that were encased within them. The community of Ino was established as well in 1887 with a post office opening under that name early that same year. In March 1887, the community and post office's name was changed to Wallview. 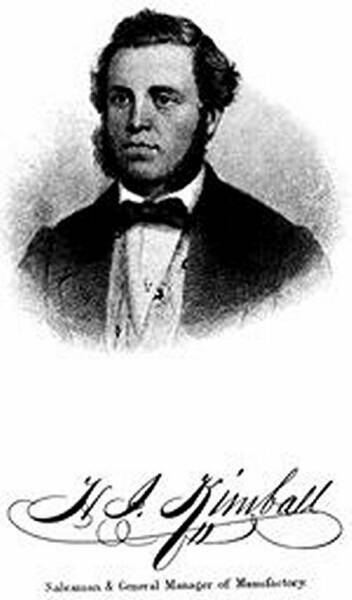 Mr. M. Alonzo Wall was the first postmaster for Ino and continued to serve after the Wallview name was adopted. William A. Wall, a brother of M. Alonzo Wall, became postmaster on September 14, 1887. Wallview was named in honor of the Wall family. By February 1888, Major J. C. Wall, a railroad contractor, Stevenson, Alabama resident and father of M. Alonzo and William A. Wall, was president of the Pine Mountain Coal, Iron, Land, Railroad & Manufacturing Company. The land around present day Kimball had been purchased by this company who actively mined the coal and iron ore found in the surrounding mountains. The settlement of Wallview that resulted was situated on the Jasper Branch Railroad between South Pittsburg and Jasper. Mining operations continued until around December 1889 when the company sold its Wallview interest to an English syndicate for 2.5 million dollars with Mr. Wall netting about $150,000 from the sale. The Anglo-American Corporation, Limited, of London, England, would handle the heaviest operations while the Kimball Town Company, made up of American investors, would build a town. 64,000 acres around the Wallview community had been purchased in the deal. Of this total four thousand acres near the Jasper Branch Railroad and the Tennessee River were set aside for a well laid out city and the remaining acreage for mining and other operations that tapped the natural resources. Hannibal Ingalls Kimball, a Maine native and former primary investor in Atlanta, Georgia following the American Civil War, was the managing director of the American company. Mr. Kimball’s name would be given to the new town replacing the Wallview name. The town site was mapped out with wide streets, avenues and boulevards. It also allowed for retail, manufacturing and housing to be constructed on town lots of varying sizes. Recreation was even considered with several courtyards and parks planned. The platted map was adopted by the Town of Kimball, Tennessee Company board of directors on June 9, 1890. That same year a passenger depot was built for Kimball on the Jasper Branch Railroad. Just a few weeks before, on May 24, 1890, ground was broke for the new town site in an elaborate ceremony with several key note speakers among which were H. I. Kimball, Professor Edward Hull, Ireland’s primary geologist, and Tennessee Governor Robert L. Taylor. Near the opening of the ceremony a red, white and blue flag with “KIMBALL” embroidered in its center along with a National Flag were raised up a flag mast 110 feet high that sat atop a large “Indian mound” just north of the railroad depot. The flags were raised by several ladies nominated to do so by Logan H. Root, president of the town company. While the flags were being raised the band played “Stars and Stripes” and on the summit of the hill a cannon gave three resounding salutes while the crowd cheered. The ground was broke by several distinguished individuals with a flower adorned spade. The ceremony lasted until around 6:00 p.m. and concluded with a benediction of praise by Rev. Bitler. Crowd gathered for groundbreaking of town of Kimball, Tennessee on May 24, 1890. Hannibal Ingalls Kimball, for whom the town is named, is pictured left center with long beard.